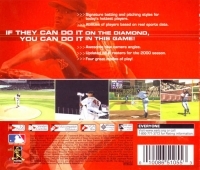 Description: Gameplay is the standard behind-the-catcher viewpoint for batting and pitching, switching to different views after the ball is hit. The famous limitation of World Series Baseball 2K1 is that you cannot control the fielders until after the ball is fielded! For this reason the game was almost universally panned by reviewers upon its release. This flaw was fixed in subsequent releases of the World Series Baseball franchise. 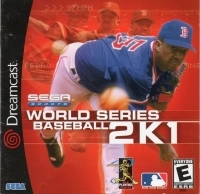 Box Text: World Series Baseball 2K1 features the actual players, teams, and stadiums of the 2000 baseball season. You can play an exhibition game or a season of 13-162 games, including an All-Star game and play-offs. 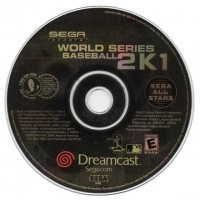 This is a list of VGCollect users who have World Series Baseball 2K1 - Sega All Stars in their Collection. This is a list of VGCollect users who have World Series Baseball 2K1 - Sega All Stars in their Sell List. This is a list of VGCollect users who have World Series Baseball 2K1 - Sega All Stars in their Wish List.